What Materials are Sushi Plates made out of? Are some materials more hazardous to your health than others? Stick around and we'll dig deep to give you all of the Answers! 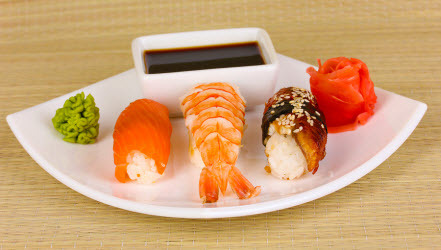 A sushi plate adds a nice touch to your presentation when you are serving sushi at home or in your sushi restaurant or bar. But with that said, let's also be honest. It can also be any old plate out of your China cabinet. Or maybe just a marble cutting board. Or a left over aluminum cheese tray from the grocery store. But what's the fun in that! Half of the fun of making sushi at home is about the presentation. And with almost every type of Japanese food a lot of the emphasis is put on the presentation. And it is the same with sushi. Maybe even more so with sushi. With that, let's try to cover some ground by getting a firm general understanding of sushi plates and what options are available and what to look for. 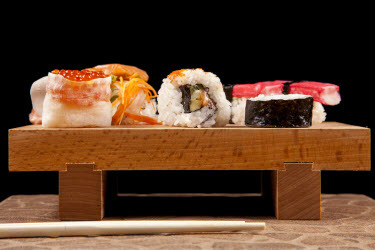 Sushi plates are made out of all kinds of materials ranging from wood to ceramic to plastic to grass (hmmm... I know what you're thinking... but keep reading; I'm not crazy :-). Look at the 2 pictures above to see an example of a bamboo plate on the left and some kind of hardwood like oak on the right. And since we are already talking about it, it might be a good time to talk about the difference between bamboo versus wood. Bamboo grows a lot faster than wood and a forest can be replaced in 3 to 5 years making it an ideal way to lessen our dependence on trees for our wood like products. And you can also eat bamboo too. Can you say that about wood? I say not... It is a very versatile plant! See below for a few comparisons between wood and bamboo to help you decide which you might want for your sushi plate. Now despite how it might have just looked, I am not anti-wood. I just listed the facts. So if you are considering some kind of a "wood like" material for your plate, like bamboo or actual wood, there are many advantages to leaning toward bamboo. If you are looking to buy a bamboo sushi plate or a wood sushi plate they have them here at Amazon. As for other materials we still have plastic and ceramic to talk about. 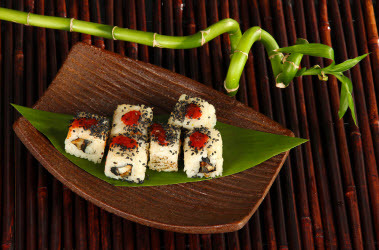 Ceramic is a given as a material for almost any kind of serving dish, including a sushi plate. It can come in a wide variety of sizes, shapes and colors. The choices are almost limitless. Ceramic is easy to clean too (dishwasher safe), although it can be broken easily if dropped, whereas bamboo, wood and plastic probably would not. If breakage by dropping is a possibility, then you might want to steer clear of ceramic and lean toward one of the other materials. Ceramic will usually tend to be heavier than a bamboo or plastic dish of the same size. In the pictures above, the one on the left is ceramic and the one on the right is melamine plastic. Hard to tell the difference just by looking at it isn't it? 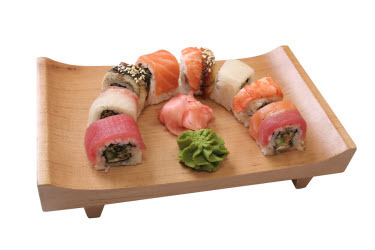 You can get a ceramic sushi plate here at Amazon. See below for a couple more examples of some ceramic sushi plates. I think a distiction is worth mentioning when it comes to plastic. Namely, what melamine plastic is. For those of you who are very selective about what you eat or what you eat it off of, melamine plastic deserves a little explanation. To be honest, I never really paid much attention to it, thinking it was just another plain old variation of plastic. But in doing research on it I was a little bit set back by it. Melamine is a chemical that has many industrial uses. In the U.S. it has been approved for use in the manufacture of some cooking utensils, plates, plastic products and paper amongst other things. Melamine has been used as a fertilizer in other parts of the world, but not in the U.S.
Can this chemical Melamine still be in the plastic tableware that I am eating off of and am I in any kind of danger? Well it just so happens that the Taiwan Consumers Foundation recently tested plastic tableware that came from China. They found that it contained melamine at a level of 20,000 parts per billion. This type of tableware is made using a substance called melamine-formaldehyde resin. (Formaldehyde I used personally when I use to do taxidermy. It was used to "preserve" the fleshy and meaty areas of birds, animals, and reptiles that could not be skinned in the traditional way. It was, to say the least, highly toxic). This melamine-formaldehyde resin helps to form, at a molecular level with heat, the shape of this plastic tableware. A small amount of this melamine is actually "left over" after this chemical reaction takes place that forms this tableware and actually stays in the plastic. This left over melamine can also be very slowly migrated out of the plastic and into the food that comes into contact with the plastic tableware. According to the FDA, melamine does not migrate from tableware into most foods. The only measurable migrations have been found to be with acidic foods under exaggerated conditions (food held on tableware at 160 degrees Fahrenheit for two hours or more). Do not heat food in the microwave on melamine plastic. It would be best to heat food on ceramic or other cookware that is microwave safe and then transfer it to the melamine based tableware. 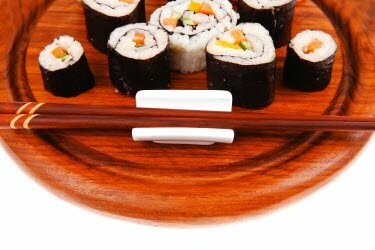 It looks like there is no danger in using a melamine based sushi plate. Sushi will not be heated so it should be perfectly safe. But when I discovered this, I found it quite interesting and thought that maybe others would want to know about this also. Especially those who do not like to take any risks with their health or with the health of others. If you want to look at some plastic sushi plates, check them out here on Amazon. And keep in mind that some sushi plates are made out of lacquered plastic too not melamine plastic so check out the product details to find out which it is made out of. If you want to read more information about melamine, go to the FDA site where most of this information was obtained. 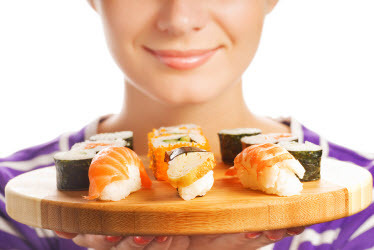 So which Sushi Plate is right for you? 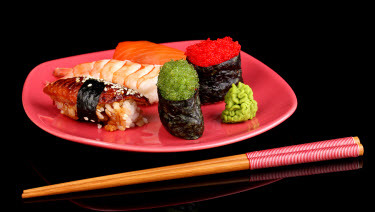 As you can see, sushi plates come in all kinds of materials, styles, shapes and colors. The choice for you will come down to how you are going to use it, what type of aesthetic appeal you are looking for and what you want to pay for it. But whatever you choose, I'm sure it will add tremendous visual appeal to your sushi whether it is at home or in your own sushi bar.